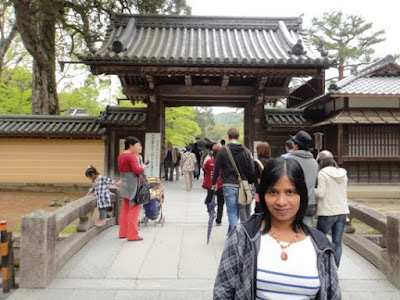 As I wrote in the previous post, hubby and I had been to Nara and Kyoto during golden week holidays. On 29th April, we visited Horyuji Temple in Nara and stayed at a hotel in Tsuruhashi district of Osaka prefecture. On the morning of 30th April, we left the hotel at about 9 am. 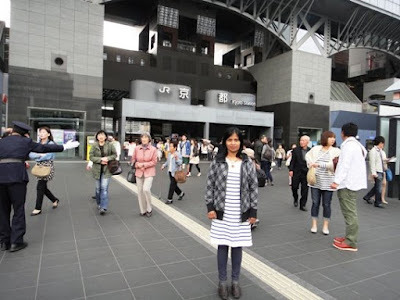 We travelled by a few trains and reached Kyoto railway station in Kyoto city at 10 am. In Kyoto city, first we visited Kyoto Tower which is located right across the railway station. It is an observation tower which is the tallest structure in Kyoto. 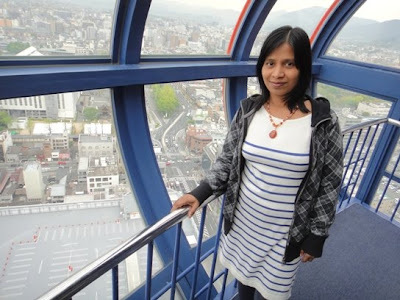 The tower is 131 meters tall and is one of the few modern landmarks in the city. The observation deck is located at a height of 100 meters and offers a 360 degrees panoramic view of Kyoto. 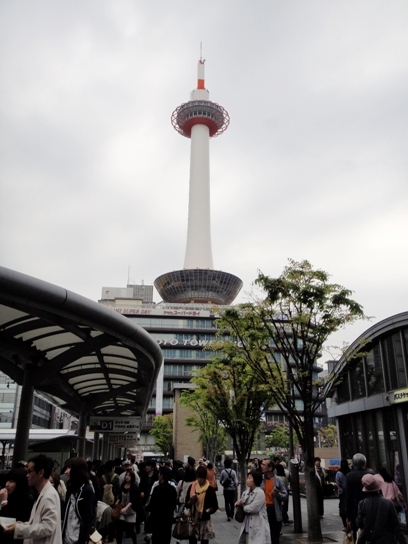 Built in 1964, the concept behind the characteristic shape of the tower is a lighthouse built to illuminate Kyoto. 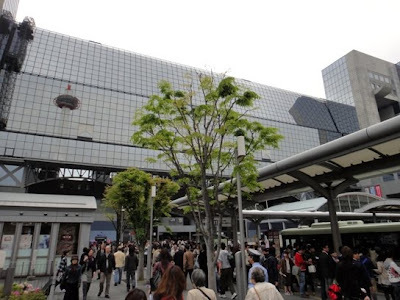 The 800-ton tower is built on the rooftop of a nine-storied building with three sub-floors. So this building serves as the foundation for the tower. The shape as well as the architecture of the tower is special. The tower is an example of Monocoque architecture where the thinner outer shell supports the weight of the structure. The tower's interior structure consists of many steel rings stacked on top of each other and then covered with lightweight steel sheets with a thickness between 12 and 22 mm. The sheets were then welded together into a cylinder. We purchased tickets worth 770 Yen per person as admission fee from a ticket counter located at the first floor of the tower building, and then an elevator took us to the 11th floor of the tower complex. 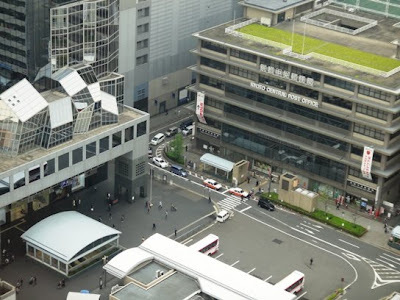 At this floor, we took another elevator and went up to the 15th floor where the upper floor of the observation deck is located. 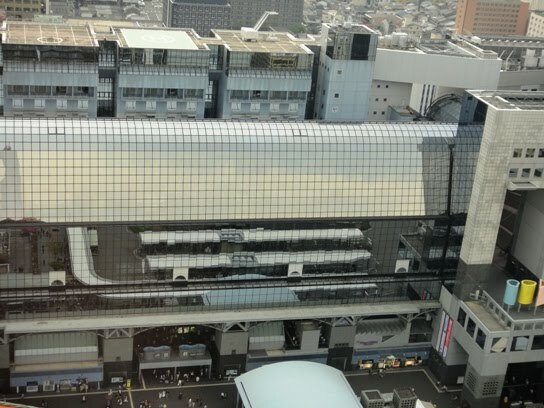 From the observation deck, we got a wonderful view of Kyoto railway station as well as a post office building located nearby. 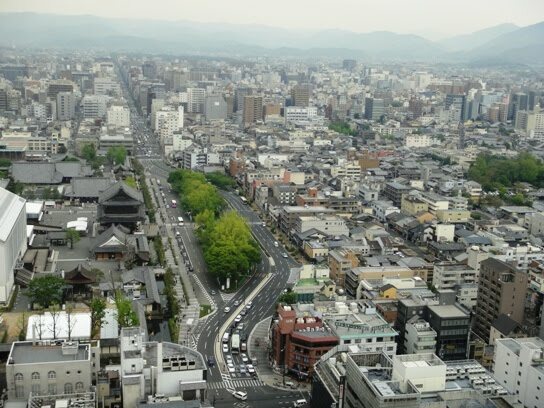 From the height of 100 meters, we got a beautiful view of Kyoto city and its surroundings. We saw a lot of concrete high-rise buildings around the tower area. In between these new buildings, we got a glimpse of the old traditional temple buildings like Higashi Hongwanji Temple and Nishi Hongwanji Temple. 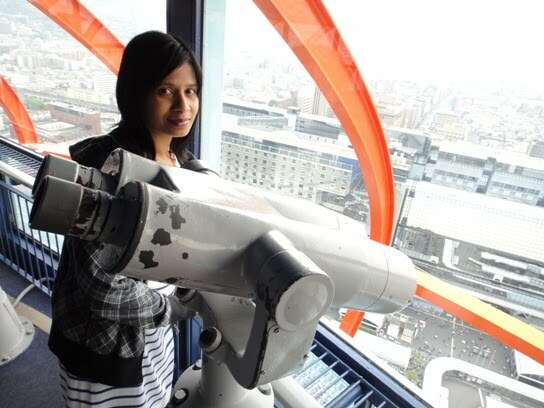 There were several telescopes available free of charge on the observation deck. So we took our time and looked at various spots in details. Looking through a telescope to our left in the background, we saw a very clear image of a five storied pagoda and a statue of Ryozen Kannon. 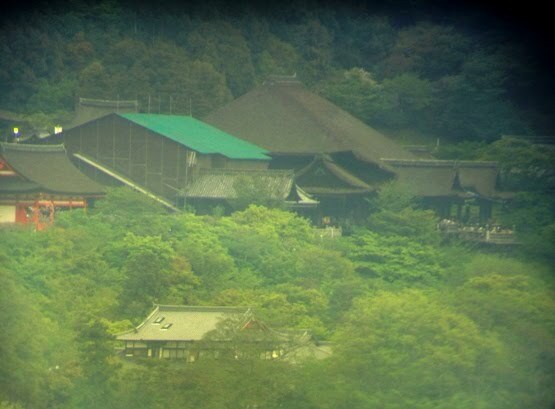 Somewhere in the middle portion of the background, we saw Kiyomizudera Temple complex. 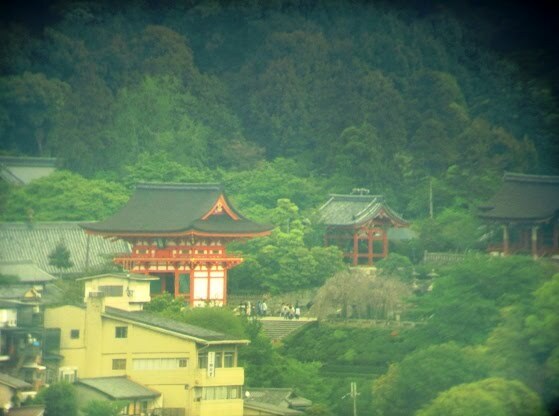 And to our right in the background, we saw a temple named Chishakuin. 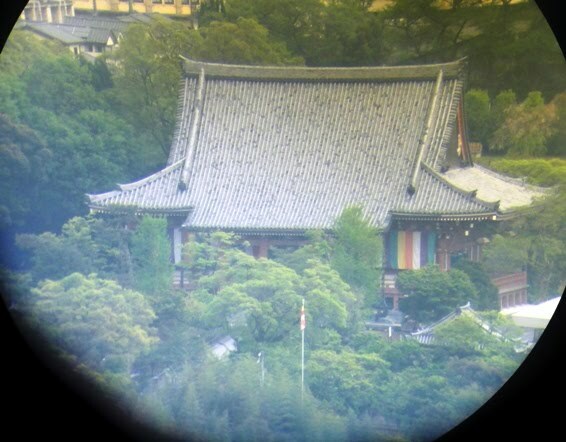 We could see these temples in great details although we were so far away. 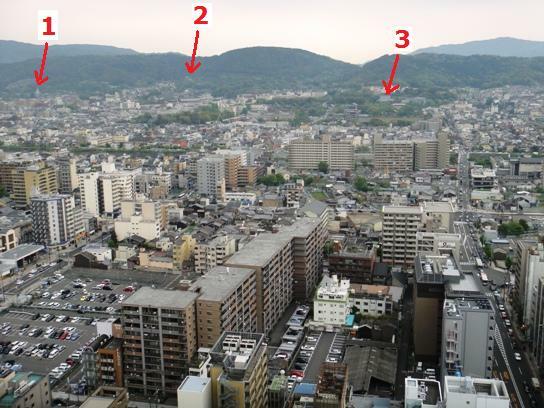 View of Kyoto city from the observation deck of the tower. 1, 2, and 3 represent the locations of a pagoda along with a statue of Ryozen Kannon, Kiyomizudera Temple complex, and Chishakuin Temple, respectively. After enjoying the views of Kyoto city from the 15th floor observation deck of the tower for some time, we walked down the steps to the 14th floor observation deck for taking an elevator to go back down to the 11th floor. While walking down the steps, the glass panels surrounding the observation deck made me a bit dizzy. 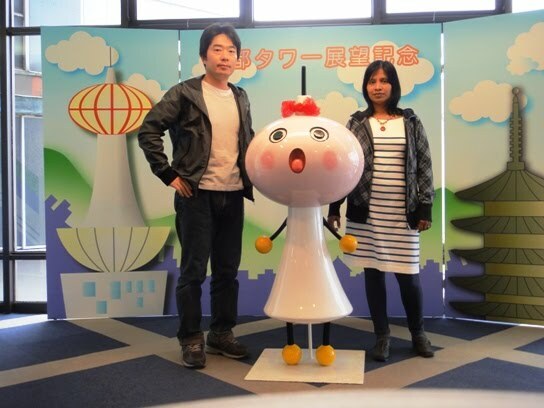 At the 11th floor, we took a photo along with the tower mascot character Tawawa-chan. 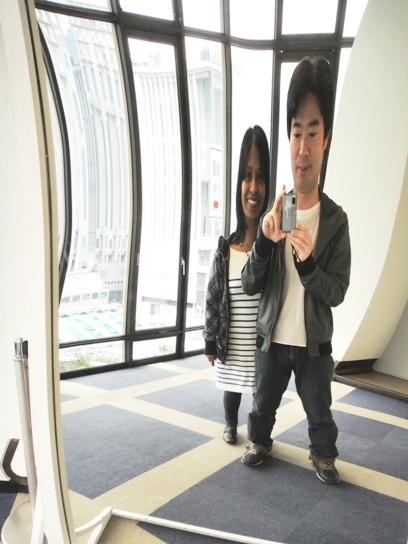 At this floor, there was a mirror that made us look so funny. We had a nice laugh seeing ourselves in the mirror. We left Kyoto Tower complex at about 11 am. 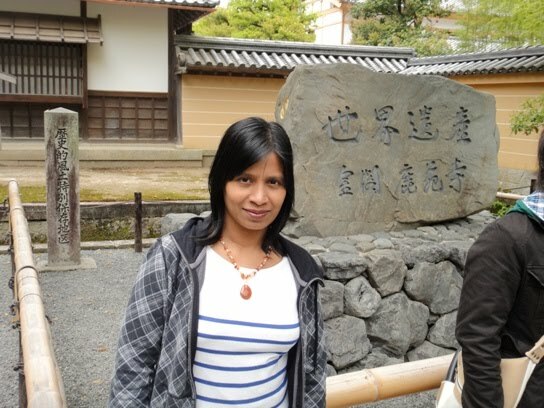 Next, we went to see Kinkakuji Temple. 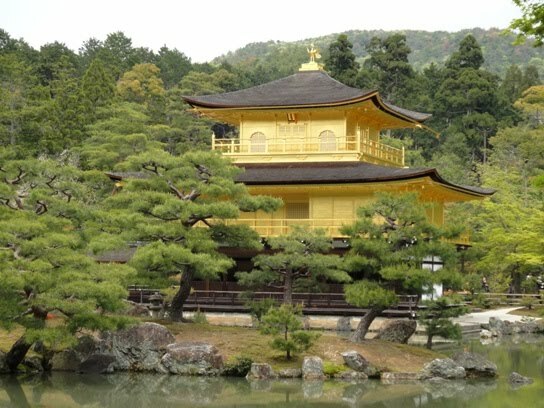 Kinkakuji Temple is located about 9 kilometers north of Kyoto railway station, and generally takes about 25 minutes to reach there by car. 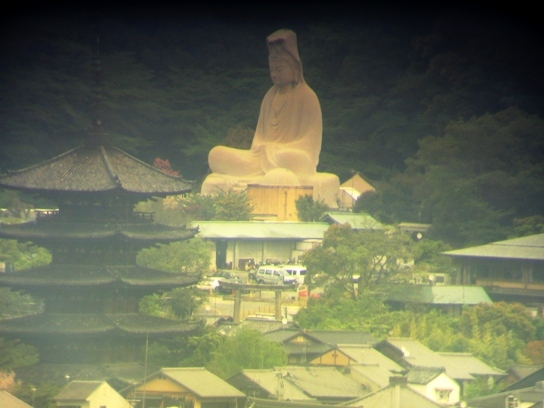 We took a bus and it took us almost 1.25 hours to reach the temple. 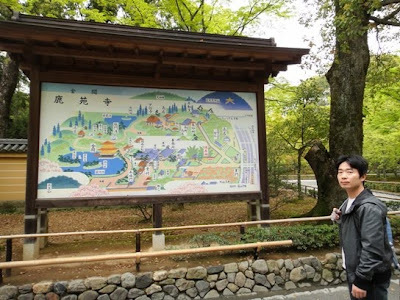 Since it takes a lot of time to travel by bus, we avoided using them for further sightseeing. We reached Kinkakuji Temple at about 12.30 pm. 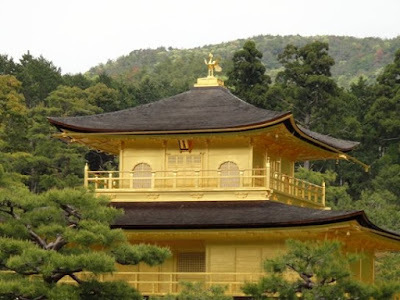 Kinkaku golden pavilion is the name of one of the buildings of Rokuonji Temple, which is a Rinzai-sect Zen temple. Kinkaku pavilion is so well known that it has given the entire temple complex its popular name of Kinkakuji. 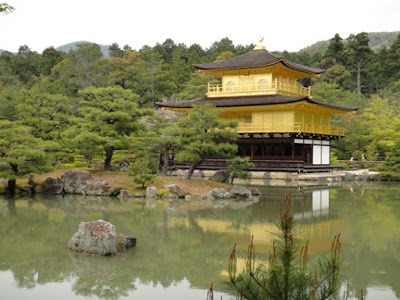 Kinkakuji Temple is one of the most popular sightseeing places in Kyoto. In 1220s during Kamakura period, the land was the site of a villa called Kitayamadai that belonged to an aristocrat named Saionji Kintsune. Later the estate withered away. In 1397 during Muromachi period, Yoshimitsu, the third shogun of Ashikaga shogunate, took over the site and build his own villa called Kitayamadono as a retirement estate. He made a special effort to make the complex a breathtaking site. 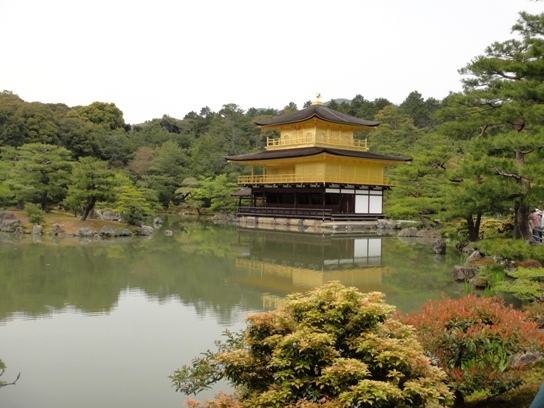 Its gardens and architecture focused around the central golden pavilion, which is an impressive structure built overlooking a large pond. After Yoshimitsu’s death in 1408, Kitayamadono was transformed into a Zen temple in accordance with his will. 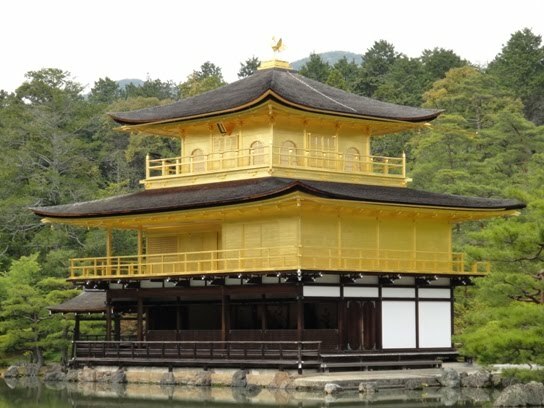 During Onin war, all of the buildings in the complex were burned down, except Kinkaku golden pavilion. In July 1950, the pavilion was set on fire by a monk and the present pavilion structure was rebuilt in 1955. The reconstruction is believed to be an exact copy of the original pavilion. However, an extensive thicker gold-leaf coating was used during reconstruction. The gardens inside the temple complex remain unharmed by any disaster and can be enjoyed as it was hundreds of years ago. The temple was designated as a UNESCO world heritage site in 1994. 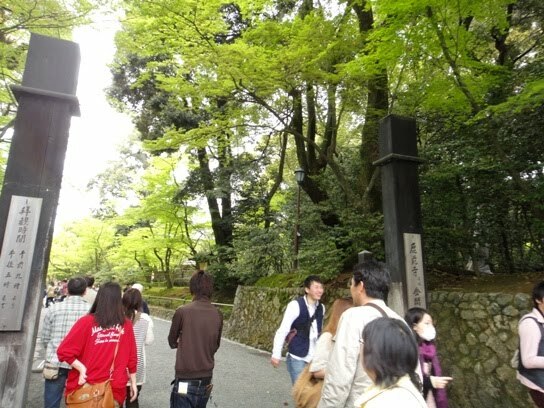 After entering a gate named Kuromon, we walked for about 3 minutes along the approach to the main gate of Kinkakuji Temple. At the ticket office, we purchased tickets worth 400 Yen per person as admission fee to the inner sanctum of the temple complex. We also received a paper talisman along with the tickets. We entered the main gate named Somon and walked inside the temple precinct. To our left, we saw Shoro bell tower. 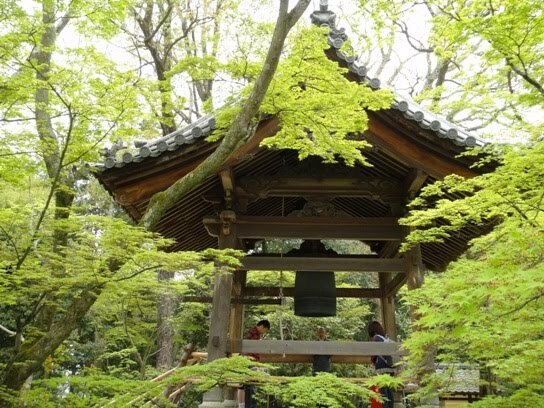 The bell housed in this structure was originally owned by Saionji family and is thought to date back to Kamakura period. 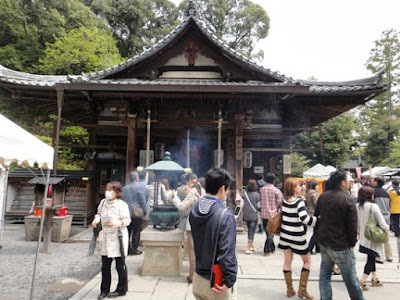 As we walked further, we passed by Hondo main hall, the abbot’s chamber, and priests' quarters located to our right. Visitors are not allowed to enter inside these buildings. Next, we walked through another gate, and a large pond along with the golden pavilion became visible. Kinkaku golden pavilion is set in a magnificent Japanese strolling garden. 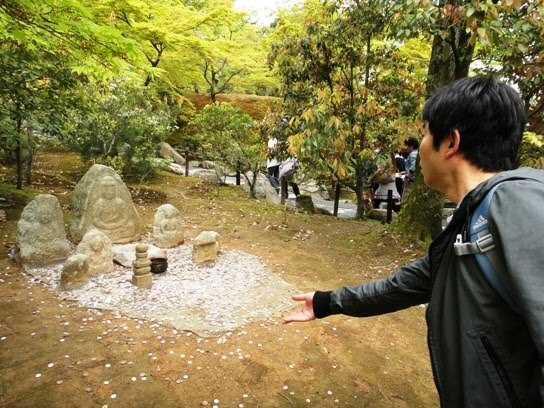 In fact, 92400 of the 132000 square meters of land in the temple precincts are devoted to gardens, which are considered to be a historical landmark. 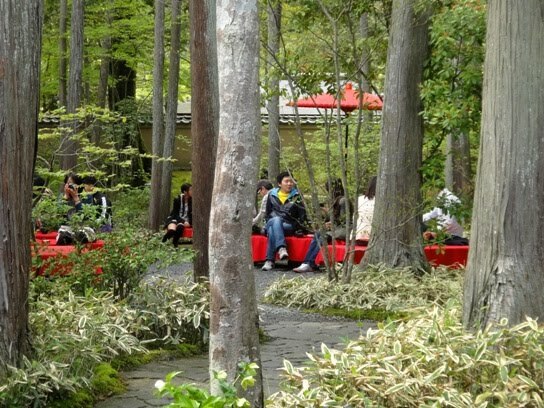 At the center of these gardens is a large pond named Kyokochi, which covers about 6600 square meters of space. The pavilion is built overlooking Kyokochi pond. This pond is like a mirror that beautifully reflects the pavilion building. The pond has lotus plants, several rare rocks, and many small as well as big islands. The largest one of these islands is named Ashihara Island. Kinkaku golden pavilion is the main attraction of the temple complex. The pavilion building is also called Shariden reliquary and houses the sacred relics of Buddha. It is a three-storied building which is 12.8 meters high, 10.0 meters wide, and 15.2 meters long. Each floor of the lavish pavilion is designed in a different architectural style yet the three harmonize well and creates a spectacular effect. The first story is known as Hosuiin, which is built in Shinden-zukuri palace style associated with Heian period nobility. 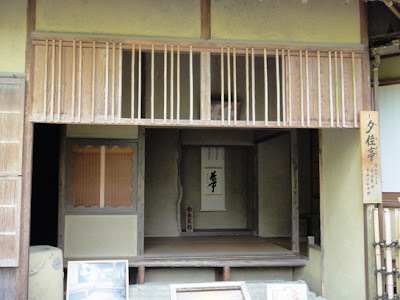 The second story called Choondo is built in Buke-zukuri style used for samurai houses. 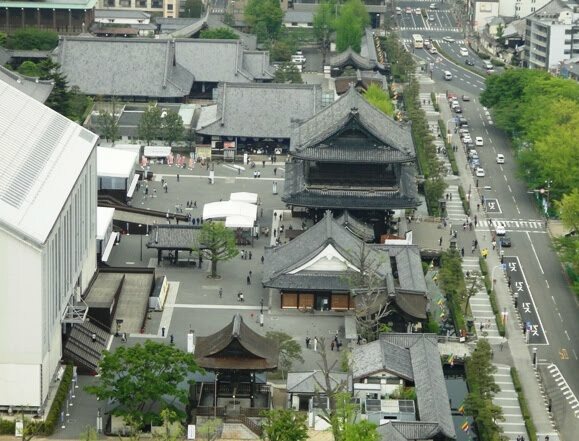 The third story called Kukkyocho is built in Karayo (Chinese architecture) Zen temple style. These three divergent styles are masterfully combined in the pavilion and is an outstanding example of Muromachi period architecture. The exterior of the first story is built of natural wood pillars and has white walls. 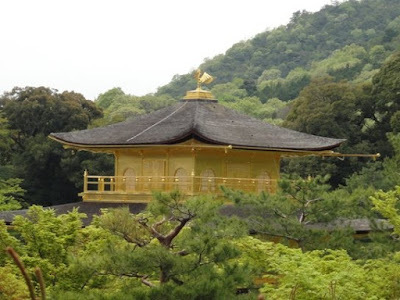 However, the exterior of second and third stories are coated with lacquer and completely covered with pure gold-leaf, which contrasts yet complements the first story of the pavilion. In 1987 the building was given a new coating of lacquer and was gilded with gold-leaf that was much thicker than the original ones. In addition, replicas of the ceiling painting and the portrait of shogun Yoshimitsu placed in the first story were also restored. 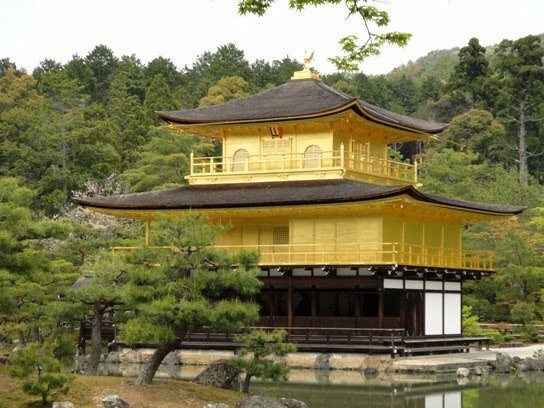 The roof of the pavilion is thickly shingled with thin boards of sawara Japanese cypress and crowned with one meter high gilded finial statue of a phoenix, an imaginary bird with auspicious associations in China. The roof was restored in 2003. We got beautiful view of Kinkaku pavilion from across the pond and took several photos of the pavilion. 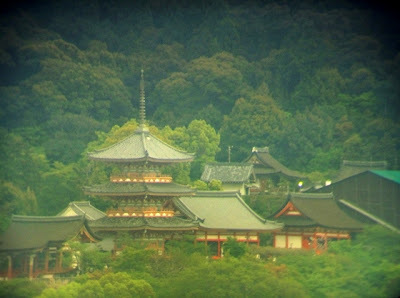 We changed our position a bit and got a wonderful front view of Kinkaku pavilion with Ashihara Island in the foreground. 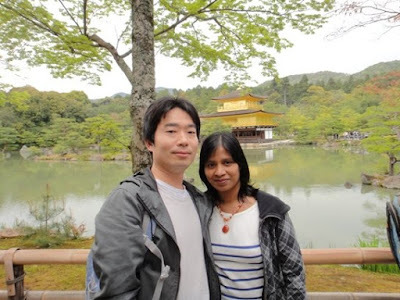 After viewing Kinkaku pavilion from across the pond, we walked on a path that passes by the pond. To our right, we again passed by the abbot's former living quarters although this time we got another view of this building. 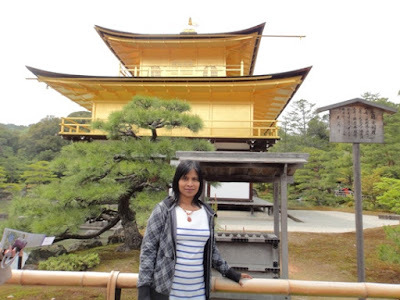 While walking on this path, we again took a few photos of the golden pavilion overlooking the pond. After walking for some time, the path once again passes by Kinkaku pavilion from behind. The pavilion looked wonderful from all directions and angles. The path then leads through the gardens of the temple complex which have retained their original design from Yoshimitsu's days. The gardens hold several spots of interest. 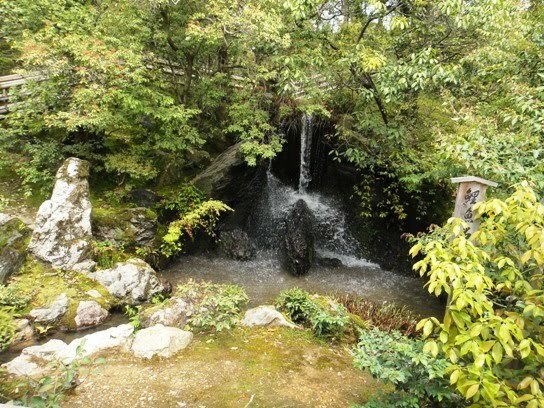 We climbed a flight of stone steps and walked further on the path which led us to a waterfall named Ryumon Taki. The waterfall drops a distance of 2.3 meters before emptying into the pool below. In the pool there is a diagonal rock that resembles a carp fish. The rock seems to rise up out of the water at the base of the falls, which gave us the image of a carp swimming upstream. According to ancient Chinese mythology when a carp climbs up the waterfall it transforms into a dragon, and hence this waterfall is named Ryumon dragon gate. We climbed a few more steps and came to a place where there were a few stone statues in the temple grounds along with a small metal bowl to throw coins at for good luck. Hubby could throw a coin into the vessel at his first attempt itself. Climbing another staircase and a bit more walking took us to Sekkatei Teahouse, which was added to the temple complex during Edo period. 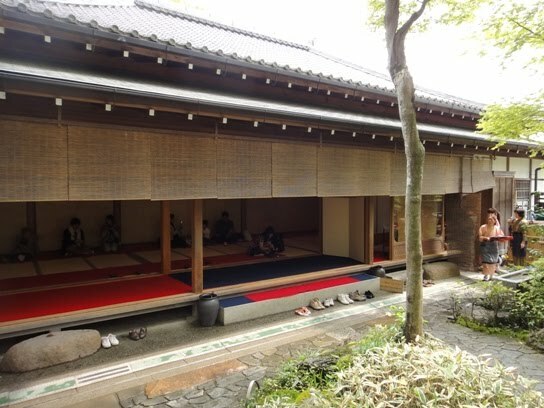 It is a small teahouse built in honor of a visit by Emperor Gomizunoo in the 17th century. 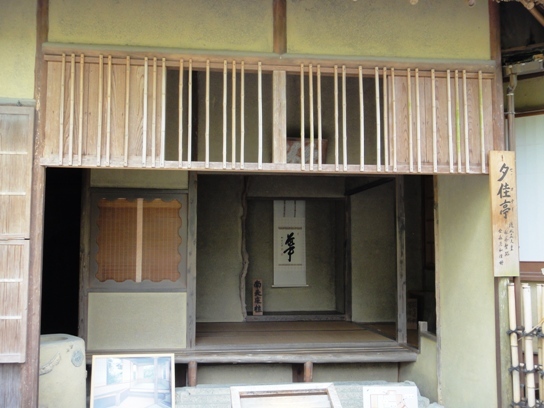 It is a simple three-tatami mat structure built in sukiya style. Its location offers an excellent view of the setting sun reflecting off the golden pavilion. The teahouse burned down in a fire in 1874 and was reconstructed in 1884. The house was restored in 1997. From the teahouse area, we got a wonderful view of the topmost story of the golden pavilion. 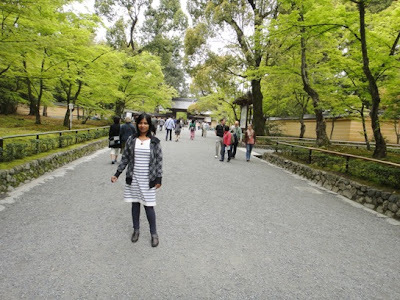 We strolled through the gardens for some time and then exited the paid area of the temple grounds. 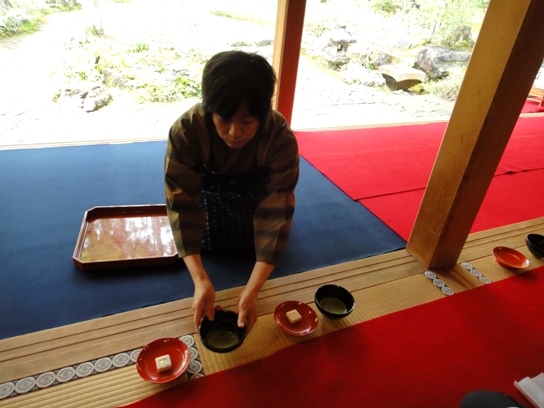 Next we went to the visitors’ teahouse which was a peaceful place. 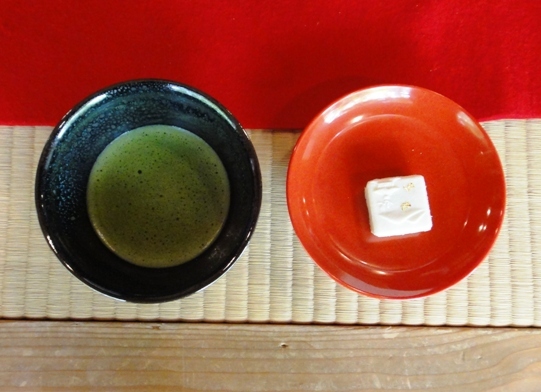 This place serves matcha whipped green tea and sweets for 500 Yen. Seats are available in the adjoining garden as well as inside the teahouse. 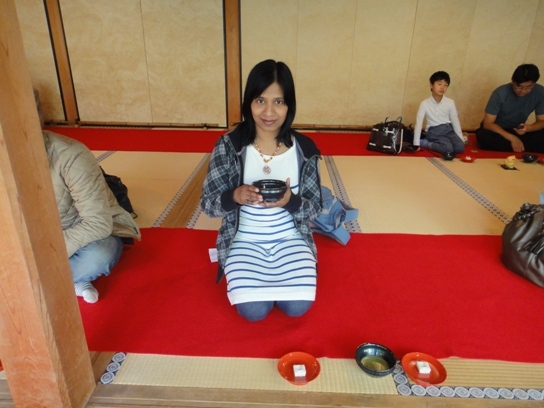 We preferred to sit inside on tatami mats and enjoyed our tea. Next, we went to a hall named Fudodo located near the visitors’ teahouse. The principal icon of worship in this hall is a stone statue of Fudo Myoo which is thought to have been carved by priest Kukai during Heian period. Fudo Myoo is the god of wisdom and is the protector of Buddhism. Just in front of the hall there is a large cauldron of incense, smoke from which is believed to bestow good health. I prayed at the hall and wafted incense fumes over my body. 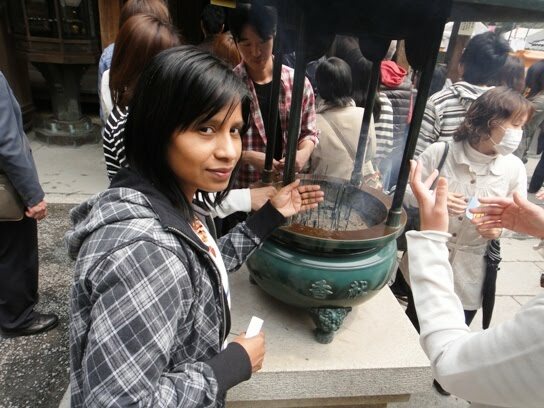 Finally, we went to one of the souvenir shops located near the exit of the temple precincts. We bought a pair of shiawase (happiness) dolls as souvenir. 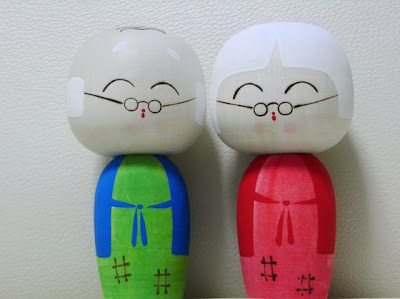 The wooden dolls look so cute. 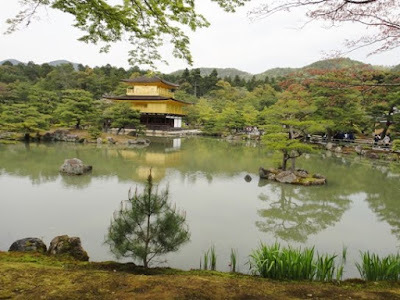 We left Kinkakuji Temple complex at about 2 pm and next went to see Ginkakuji Temple about which I will write in the next post. Nice post ... Never been to Japan so this was a really nice preview. Loved the views from the observation tower. Nice pictures Manisha. I wish I could click and see images in full resolution and size to see closer details. Thanks! Thanks for your comment Madhu. Good to know that you liked the photos. Japan is a wonderful place where we can see ancient traditional and ultramodern things side by side. Thanks for your comment 'Anonymous'. Great to know that you liked the pictures. The place where I live, the internet often has problem when I try to upload a large picture file in the blog. Back in 2008, I used to upload full resolution pictures...Unfortunately now I cannot. But in case you wish to see any photo in details, do send me a mail and I can send you the pictures as uploading in mails seems to have no problem. 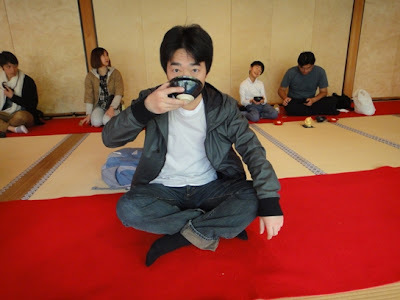 Wow, you've been to many places in Japan. Kyoto Tower Hotel reminds me of Space Needle. ANd I like the Golden Temple so much. 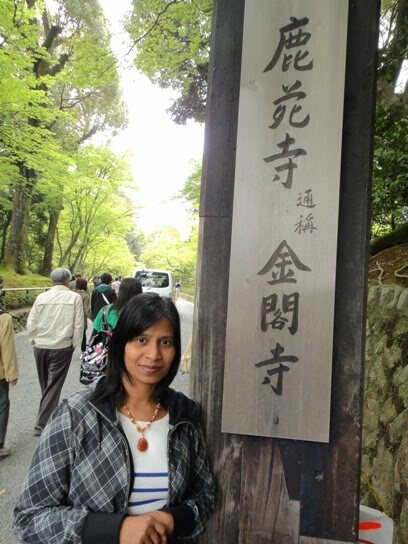 Hope to visit it again! 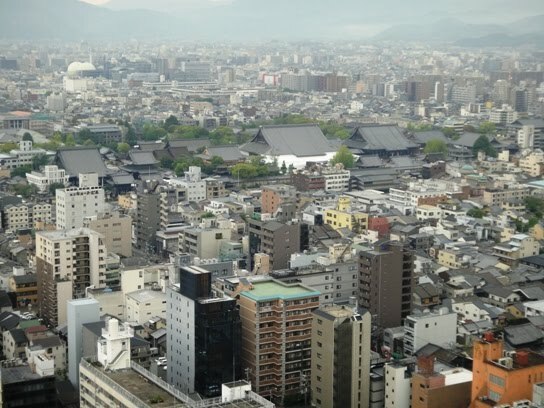 @ Kyoto Tower Hotel....Yeah Kyoto is a beautiful place with many beautiful shrines and temples. Hope you can visit Kinkakuji again.